It’s the time of year where winter sports teams start recruiting and training. For many sports, an important piece of equipment is a sports mouthguard. A mouthguard helps to prevent injuries to your teeth and jaw during sports and other active pursuits. It does this by absorbing the energy of the impact, preventing the full force from being transmitted to the teeth and jaw. Properly-fitted mouth guards can even reduce or prevent the effects of concussion. However, not all mouth guards are equal when it comes to providing good protection. The best mouth guards are custom made to fit the shape of the teeth and mouth exactly, and are made of high quality materials that are designed for protection. A mouthguard can only be made to fit the mouth properly if it is built on a model (plaster cast) of the teeth and gums. The special protective plastics that are used to make a mouthguard need to be heated to a very high temperature and are then pushed or pulled by air pressure onto the plaster cast to fit the shape perfectly. This is a process that obviously can’t be done directly in the mouth, which is why dentists will make a mould of your teeth and gums when you are having a mouthguard fitted. Custom-made mouth guards can be smoothed and thinned on the edges for comfort without compromising the protective properties of the material. Because they are constructed to fit the mouth like a glove, they stay in place without the athlete having to keep their teeth clenched together. Mouthguards that are bought over the counter cannot be moulded to accurately fit the mouth. Even “boil and bite” mouthguards can’t be softened sufficiently for the material to flow properly. These guards don’t provide the coverage needed to provide protection: they seldom extend far enough onto the gums, so don’t provide protection to the bone that holds the roots of the teeth. Since store-bought guards don’t hug the shape of the mouth, the athlete often has to chomp down on them to keep them in place. Sometimes they fall out, and sometimes they become such a nuisance, they end up being worn in the pocket rather than in the mouth. Over the counter guards tend to be bulky, and are difficult to trim without leaving roughened edges, and this is another factor that makes young athletes reluctant to wear them. No one wants to hold something in their mouth that rubs against their gums and cheeks, or that makes swallowing or breathing difficult. Many parents know that a custom-made mouthguard is the best option, but worry about the price of having mouth guards specially made for each child. There’s no denying that store bought mouth guards end up being much cheaper: however, if an accident happens and the cheaper mouthguard proves to offer no protection, this can be false economy. The cost of repairing lost, broken or damaged teeth can run into many thousands of dollars, and treatment can be ongoing for many years. The pain, both physical and emotional, of losing teeth can be severe. Your investment in a correctly-fitting mouthguard gives the best possible protection against damage and the associated costs and pain. Essentially, a properly-fitting mouthguard is like an insurance policy for your child’s teeth. Consider it a cost of playing the sport, just like uniform, footwear and other equipment. If you have any questions about sports mouthguards for your child, give us a call or visit our page about Mouthguards. This article was first published on February 24, 2014. It was updated in February 2019. 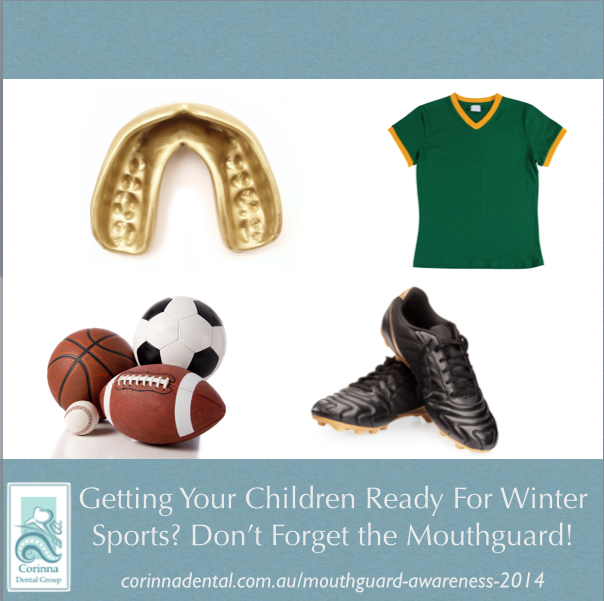 Next Post: For Which Sports Should Your Child Be Wearing A Mouthguard?